Cecile Smith, age 101, of Aurora, passed away Thursday, August 23, 2018, at Memorial Community Care. A Graveside Service for family and friends will be held at 10:30 A.M., Saturday, August 25th at the Aurora Cemetery. Rev. Michelle Reed will officiate. Interment will be in the Aurora Cemetery. Visitation will be from 5 – 7 P.M. Friday at Higby-McQuiston Mortuary. In lieu of flowers memorials may be given to East Park Villa or Memorial Community Care. Higby-McQuiston Mortuary is in charge of arrangements. Condolences may be e-mailed to the family through the mortuary website at www.higbymortuary.com. 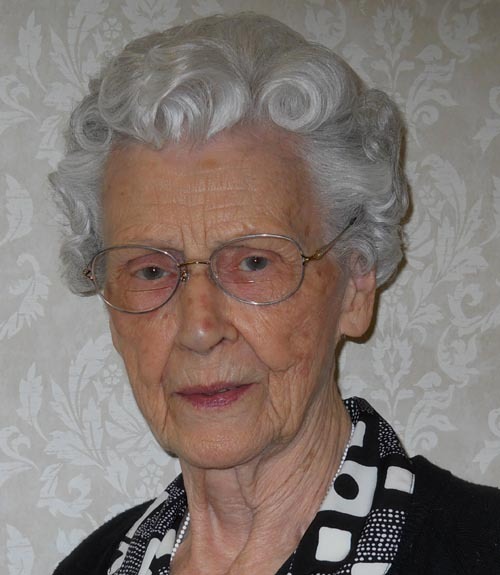 Cecile Marlene Smith, the daughter of Harry and Aurilla (Eastman) Stewart, was born at Sargent, Nebraska, on May 24, 1917, and passed away in Aurora, Nebraska, on August 23, 2018, at the age of 101. She grew up in Sargent and graduated from Sargent High School. Following her graduation she lived and worked in Grand Island. On April 5, 1941, she was united in marriage to Claude Smith at Kearney, Nebraska. Following their marriage they lived and farmed southwest of Aurora. Claude passed away on February 10, 1989. Cecile moved to the East Park Villa in 2011 until she had to enter Memorial Community Care. Cecile enjoyed quilting and was known for her cooking and baking. She was preceded in death by her parents, husband, daughter, Karen two granddaughters, one great-grandson, two brothers and three sisters. Those who remain to cherish her memory are her five sons, Larry (Mary) Smith of Boise, Idaho, Ron Smith of Aurora, Jim (Karen) Smith of Giltner, Ken (Karry) Smith of Giltner, and Phil (Peg) Smith of Aurora; son-in-law Robert Hendrickson of Sun City West, AZ. She is also survived by 20 grandchildren, 28 great-grandchildren and many other family members and friends.